Today I went to my local Walmart to redeem a Chiquita Banana coupon I was sent for being a Chiquita Mom. The cashier REFUSED my coupon. I was so confused I told them its a manufacture coupon and I had the right product and the correct amount. I was told they no longer accept manufacture coupons for a product that is FREE. I still in shock paid for my items then went to customer service to ask them. I was told the same thing. That they will refuse them but will take BOGO coupons but not the other. The woman at customer service told me that since Walmart has such low prices they do not want to give things away for free. I was puzzled since the manufacture covers the cost of the item. I have always been annoyed by Walmart but this just takes the cake on the crappy customer service of the store. I could understand if it was a computer printed one or something but it was a shiny new crisp coupon sent directly from the company. I won a few free wipes packs from Huggies Rewards and I was going to redeem them at Walmart and pick up some dog food, but now I will go to Safeway to use my coupons and spend my money! On a side note of funny and creepy things at Walmart I wanted to share a story. 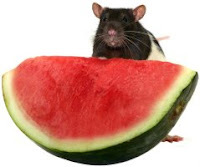 The summer I was pregnant with my son I was totally craving watermelon like at every moment and one time we went up there I was selecting a big watermelon and almost touched a RAT!! As I pushed one watermelon aside to get to another out the rat popped. He looked right at me with his big eyes and he had the nastiest thick tail. I did scream lol and threw my watermelon back in the bin and went to Raleys to get my watermelon. I told a cashier on my way out and she did not seem to even care. Since that day I refuse to buy my produce from there and now with this last incident I will not be going back anytime soon and definitely not trying to use coupons there. Do you have any Walmart horror stories you would like to share?!? Sadly my WM is the same way, they won't take free or BOGO OR SS coupons either!! Honestly I've never understood the whole "we don't want to lose money" comment considering they are getting more than what we would have paid them with that additional eight cents they get! My WM told me that they won't accept those coupons because they have had to deal with a lot of fraudulent coupons ... I seriously doubt that very much! Wow, that really stinks. I can't believe they refused the coupon. Same thing happened to me!! I wrote a post about it too. I have stopped shopping there.